HispanicNashville.com: Documentary condemns Nashville's Corrections Corporation of America for role in "largest trend of family internment since World War II"
Documentary condemns Nashville's Corrections Corporation of America for role in "largest trend of family internment since World War II"
In an era of family-dividing deportations, the immigration arm of the U.S. government has arranged for Nashville-based Corrections Corporation of America ("CCA") to house immigrant families together, but where and how the families are placed has been framed by some as a moral and human rights crisis. 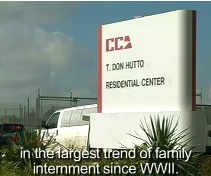 CCA's T. Don Hutto Residential Center in Taylor, Texas, which for the past few years has housed families including pregnant women and children, has been the subject of a litigation settlement with the ACLU, a thwarted inspection by the United Nations, an investigative report by the Women's Commission for Refugee Women and Children, multiple vigils, petitions, and now a documentary called, "America's Family Prison." ICE chose to develop a penal detention model that is fundamentally anti-family and un-American. detaining immigrant children at Hutto is inappropriate. accompanied and unaccompanied children are temporarily detained in adult detention facilities which do not adequately protect the rights of child migrants. largest trend of family internment since World War II. The recent increase in family detention represents a major shift in the U.S. government’s treatment of families in immigration proceedings. Prior to the opening of Hutto, the majority of families were either released together from detention or separated from each other and detained individually. Children were placed in the custody of the Office of Refugee Resettlement (ORR) Division for Unaccompanied Children’s Services, and parents were detained in adult facilities. the judicial nomination of CCA's top attorney, Gus Puryear, to a seat on the bench of the U.S. District Court for the Middle District of Tennessee. Who is asking the questions in Nashville? According to most reports, Nashville-based CCA is keeping its comments on Hutto to a minimum, with the most significant response being the settlement of the ACLU litigation and improved conditions at the facility. But have the executive team, the board, or the shareholders considered big-picture questions regarding the detainment of families and children in general? Has anyone at CCA headquarters asked whether, as Amnesty International asserts, child detention itself is improper? Was there a point when CCA's top attorney should have advised against the contracts to detain children at Hutto, as one letter to President Bush asserts? Beyond CCA itself, should Nashville be brought into the dialog about what its hometown corporation does for the federal government? The Nashville media don't appear to have reported on Hutto, despite significant coverage in Texas media. Middle Tennessee journalists (or their managers) are paid to know what their readers and viewers would find newsworthy, and that might not include the detention of families by a local company and the hubbub about it raised by groups in Texas and elsewhere. Or, maybe CCA has good answers to all of these questions, and Nashvillians would see no controversy. Ultimately, it appears that the concerns that have been raised about a locally-owned facility located hundreds of miles away in South Texas have been, and may remain, a nonissue in Tennessee.